Barack Hussein Obama II ( i/bəˈrɑːk huːˈseɪn oʊˈbɑːmə/; ubezalwa 4 ngoNcwaba 1961) ngumongameli weMelika. Iyibizo futhi weculo ngebhendi Izingane Zoma. ↑ "President Barack Obama". Washington, D.C.: The White House. 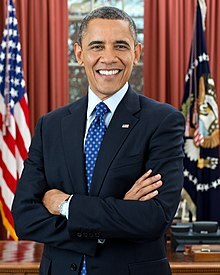 2008. http://www.whitehouse.gov/administration/president-obama. Retrieved December 12, 2008. ↑ "Certificate of Live Birth: Barack Hussein Obama II, August 4, 1961, 7:24 pm, Honolulu". Department of Health, State of Hawaii. The White House. April 27, 2011. http://www.whitehouse.gov/sites/default/files/rss_viewer/birth-certificate-long-form.pdf. Retrieved April 27, 2011. This page was last edited on 28 uNhlolanja 2018, at 08:52.